Peacock is a very beautiful bird. It dances elegantly when it sees dark clouds in the sky. It's feathers are really very beautiful. We have written the useful essay on peacock for school students. Choose any one according to your need. 1. The peacock is our national bird. 2. It is a very beautiful bird. 3. It has a long neck. 4. It has lovely blue feathers. 5. The peacock is proud of its tail. 6. It feels happy when it sees the cloud in the sky. 7. It starts dancing when it sees dark clouds in the sky. 8. It eats fruits, seeds, grains, worms, and snakes. 9. It likes to live on the hill or in dense forest. 10. Many people like to pet peacocks in their homes. The peacock is a very beautiful bird. It has a long neck and small head. Its neck is blue in colour. It has long feathers with bright eyes. Sometimes it spreads them like an umbrella. It lives on the trees in the jungle. It feeds on grains, ripe fruits, small insects and snakes. It feels very happy when it sees dark clouds in the sky and then dances with joy. It is the national bird of India. Many people like to keep peacocks in their homes. It is an enemy of the snakes. It likes to live on the hills or in thick forests. It is beautiful but not useful. The peacock is the national bird of India. It is the most beautiful bird of all the birds. It has a long blue neck and small eyes. There is a small crest on its head. Its plumage looks attractive. It has an attractive bluish-green feather on its body. There is violet half-moon shape spot on its tail feathers. The peahen is smaller than a peacock. It has no feathers, and it does not dance. It has no crest on its head. Peacocks are many found in Assam, Mizoram and Madhya Pradesh. It generally lives in jungles, gardens, and hillsides. There are two kinds of peacocks- the Indian peacock and green peacock also known as Javan peacock. 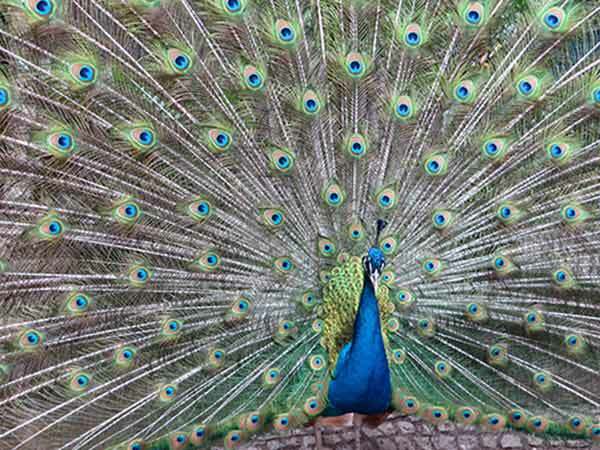 The Javan peacock is more beautiful and attractive than Indian. Its crest is taller than Indian peacock. It is generally found in Indonesia. The peacock eats grains, ripe fruits, worms, and small insects. It is an enemy of snakes. When the sky is dark in the rainy season, the peacocks are very much joyful. Such kind of season makes them very happy. On such moment it unfolds its feathers like a fan and starts dancing elegantly to attract others. It is very much afraid of tigers and lions. When it sees any tiger, it runs away from it. In the past kings kept them in their gardens. We should save these beautiful birds for future generation.